Gorgeous thick pile and perfect design for the shower or bath area. Absorbent and excellent construction with a low price tag. Gray color is fantastic against white tile. Very posh bargain. The Madison Park Ethan Rug provides comfort and simplicity in your space. Made from 100-percent cotton, this high pile tufted rug provides bold color and a simple white border for a hotel look right in your own home. The large 24x72 runner size is perfect for a double sink vanity. Dimensions 30.0 In. X 20.0 In. X 0.25 In. Perfect size for the bathroom - nice and long and oh so soft! I bought the grey rug and it goes with everything. Very happy with my purchase. If you’re looking for a double sink rug for your bathroom? I say this is the one! It’s exactly as pictured, very thick, nice quality and extends the length of the most dual sinks. It is a slightly darker gray but you can definitely use it in a wood heavy bathroom or something marble. Quality for low price. I’m it’s exactly as pictured, very thick, nice quality and extends the length of most dual sinks. It is a slightly darker gray but you can definitely use it in a wood heavy bathroom or something marvel. Amazing Quality for such a low price. 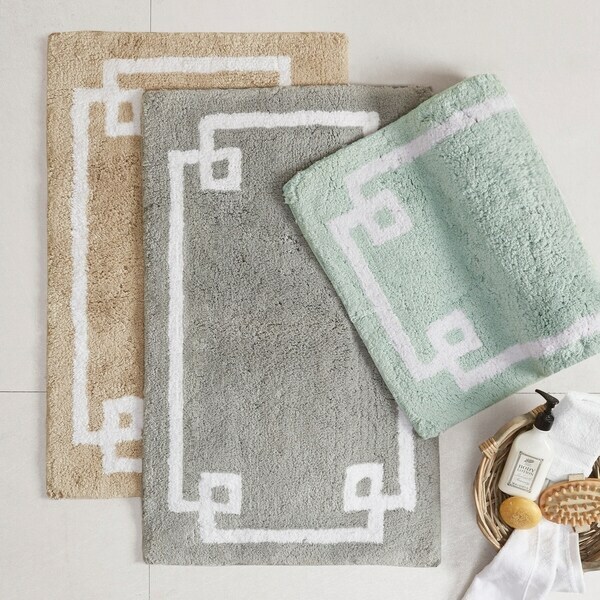 Great quality bathroom rug and the colors are great. Will be a great addition to the newly remodeled bathroom. I highly recommend this product to other overstock customers! I love this runner. 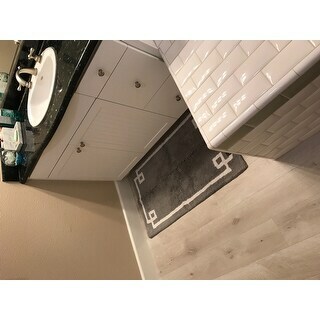 It fits the length of my vanity and is so comfortable to walk on. The only downside is that it's such a thick pile that it is difficult to vacuum. Love the look of this bath matt. I purchased the grey color and It works beautifully in our bathroom which is white, gray and marble. The classic detail makes for a very sophisticated look. I haven't washed it yet but would recommend it. Thick and the perfect color grey. Looks great with my white and grey bathroom. Love this rug. It's thick and soft. Very good quality. The beige color matched the picture. This is a great rug that looks just like the picture. It enhances the decor of my bathroom perfectly. It's soft but durable and it doesn't move easily. I would highly recommend purchasing this rug for your bathroom. Bought the set of 3 for my master bath room. Looks fantastic and feels Amazing under the feet too. Got lots of compliments for it! This looks like a nice spa rug. Matches my guest bathroom. Gives our guest bathroom a nice flush look. "Is there a rubber backing on the back?" Looks like it will work for my needs.